Where Is Camp Menominee Located? Camp Menominee is located in located in Eagle River, Wisconsin. We sit on the shores of beautiful Sand Lake on the Sugar Camp chain of 5 lakes. We have 65 beautiful acres of usable land and a 600+ acre lake. You can find us at 5035 County Road D, Eagle River, WI 54521. ACA Accreditation means that your child’s camp cares enough to undergo a thorough (up to 300 standards) peer review of its operation — from staff qualifications and training to emergency management. American Camp Association collaborates with experts from the American Academy of Pediatrics, the American Red Cross, and other youth-serving agencies to assure that current practices at your child’s camp reflect the most up-to-date, research-based standards in camp operation. Camps and ACA form a partnership that promotes growth and fun in an environment committed to safety. ACA helps member camps provide: Healthy, developmentally appropriate activities and learning experiences, Discovery through experiential education, Caring, competent role models, Service to the community and the environment, and Opportunities for leadership and personal growth. What’s the difference between state licensing of camps and accreditation by ACA? Accreditation is voluntary and ACA accreditation assures families that camps have made the commitment to a safe, nurturing environment for their children. If a state requires licensing, it is mandatory; licensing requirements vary from state to state. ACA standards are recognized by courts of law and government regulators as the standards of the camp community. How do ACA standards exceed state licensing requirements? ACA goes beyond basic requirements for health, cleanliness, and food service into specific areas of programming, including camp staff from director through counselors, emergency management plans, health care, and management. ACA applies separate standards for activities such as waterfront, horseback riding, and adventure and travel. Does ACA accreditation require criminal background checks? ACA accreditation standards require a staff screening system, which may include criminal background checks where permitted by law. When talking to a camp director as you consider enrolling your child, ask what the screening process for that camp includes. Who runs your camp? What is your directorship like? Camp Menominee has one of the most experienced team of Directors in camping. Owner/Director Jason Feldgreber is supported by a team of 5 camp professionals with over 100 combined years of youth development experience. Meet our Directors here. Who are your staff and where do they come from? The staff are the lifeblood of a good camp. They need to be skilled, compassionate, intelligent, willing and strong leaders. We have a perfect combination of former campers who want to be like camp heroes that they grew up idolizing, highly skilled athletes and coaches and international specialists. We have the best staff in the world…literally! At Menominee we have extremely high expectations and qualifications for our staff members. Each new staff member must go through the application process including multiple rounds of interviews, reference checks and background checks. Everywhere! This summer we will have campers from 65 cities in 15 states in 7 different countries around the world. Your son will interact with boys from all different backgrounds and leave camp with an international network of great friends that they will keep in touch with forever. What are the ratios of Staff to campers? Our camper to staff ratio is always at a minimum of 4:1. What are your values? How do you teach those to the boys? We hope that our system of values has come through everywhere as you navigate through our site. We have a set of standards that guide us called The Menominee Way and we expect all the members of the Menominee Family to act in accordance with it. I see you offer a 2-week Rookie Camp. Do you have any shorter Rookie programs? We do not have a Rookie Weekend at Menominee and here’s why: the idea of putting 6-9 year olds in a car or bus for 6 hours, driving to camp for 3 days away from home to “try out camp” does not seem like the best way to get to know camp or the experience of being away. Part of coming to camp for the first time is giving each camper (with the staff’s support) time to work through homesickness and grow into the camp experience. This is not achievable in just a few days. We have a few ways that boys can get exposed to camp that allow them to have a long and fruitful camp career: Father/Son Camp, 2-week Rookie Camp and Family Tours + an overnight stay. What is your policy on Technology at Camp? Aka - Please take my son's device away! Technology is great. In fact you are probably reading this right now on your phone, iPad or laptop. Parents, you can use these devices to email your child, check out our blog and even look at all the pictures we post of your smiling son every day. However, for our campers, technology is a major source of stress. We don’t want the boys staring at their phones waiting for that next message in the group text to come in. We don’t want our boys looking at all the great things other people are posting on social media. We definitely don’t want our boys playing virtual versions of the things they can do right outside of their cabins! As such, we are proud to say Camp Menominee is a SCREEN FREE CAMP. We want to promote collaboration, teamwork, interpersonal growth and development and so much more. Leave your devices at home! We are, however, a fan of artistic expression through music and arts. So if you want to send your son with an old ipod shuffle for music…great! We also have a great media program. They use our devices to learn to take and edit some of these amazing videos you see us put out during the summer. Check out this article about our camp boys understanding how important it is to be screen free! Can my son meet other boys before the summer? Absolutely! We host new camper parties before camp and are happy to put new campers in touch with each other before they come to camp. In addition, we have a Big Brother/Little Brother program for all of our new campers. Finally, please contact us at anytime and we can connect you with local families for the boys to meet before the summer. Make sure to follow our Menominee News updates for event information. Is it OK to send my son if he doesn't know anyone? Let us introduce you to Jackson. He came to camp last year for the first time without knowing anyone and had a very successful summer. 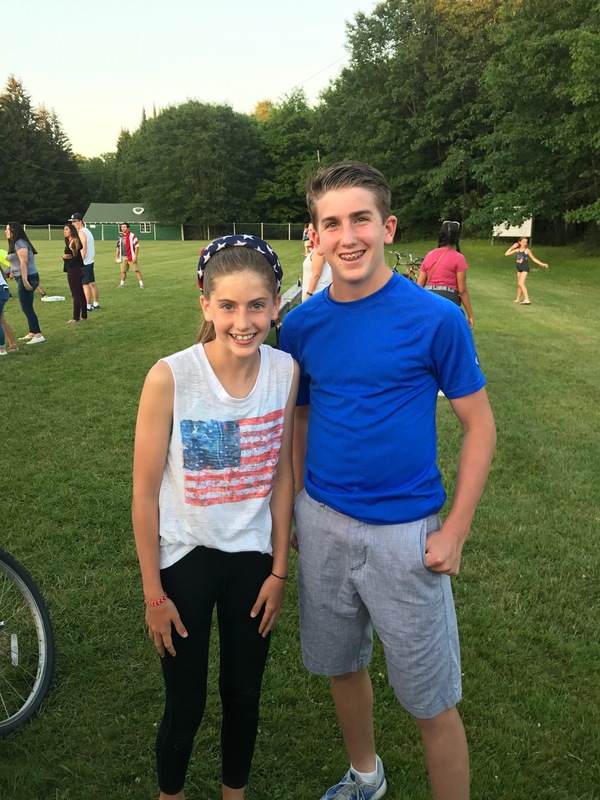 Through Jackson’s story, you’ll see what we do in the off-season and at camp to help our campers feel like they are a part of the family and make new friends. What are your cabins like? How many boys are in a cabin? Where do your counselors sleep? AMAZING! Our cabins house 6-10 campers and 2-3 counselors. We do not and will not ever have a single bunk bed in camp. Your son will get his own bed and his own space. We also have bathrooms with two sinks and a toilet in the cabins so your son does not have to leave the cabin to use the restroom in the middle of the night. Finally, there are no separate counselor quarters. This means the counselor beds are right next to the camper beds in the cabins so to ensure maximum supervision. Each cabin has a private bathroom with hot and cold running water and electricity. The cabins also come equipped with a heater for the cold summer nights. The boys shower at “Koz’s House” – with 15 modern showers that have plenty of hot water and great water pressure. Check out pictures and videos of our Cabins. How do you handle cabin placement? Can I request for my son to be with a friend? One of our philosophies at camp is that we do not go from our classroom to our cabin. 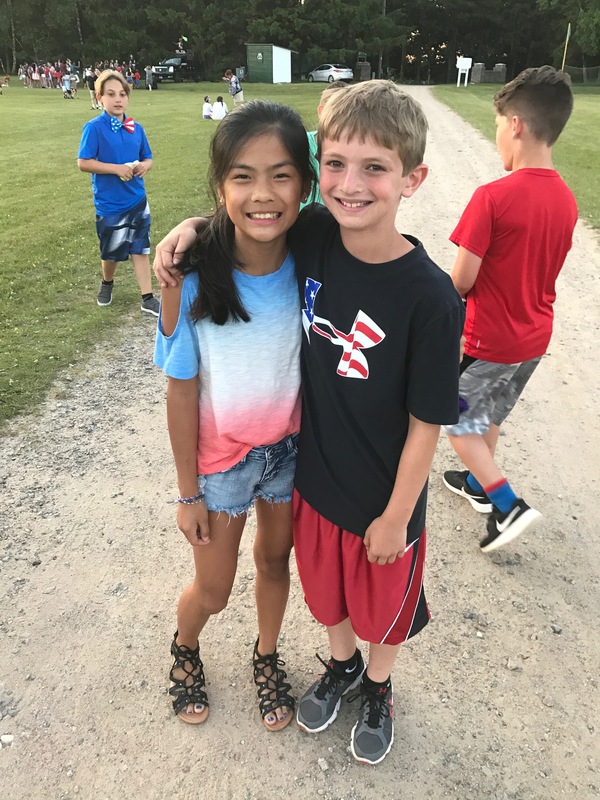 If there are a number of boys coming from a certain city or town, we will look to separate them throughout different cabins in their age group so they can meet new boys and develop new relationships. 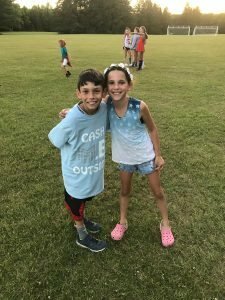 Each camper can request 2 boys they would like to be in a cabin with, and we do our best to accommodate, but ultimately we are going to make a decision that we believe is in the best interest of our campers and our camp. What are the facilities like at Menominee? We have the best grounds in the Northwoods! Take a virtual tour of our campground to see our facilities and learn more. Do you offer tours during the summer? How can I schedule one? Though we are biased…we think we have the most beautiful camp in the Northwoods and there is nothing better than seeing it in person. Contact Us today to schedule a tour over the summer. If you can’t make it in person, you can take a virtual tour of our 65-acre campground! CM has terrific food! Our chef’s make 3 fresh meals a day that give the boys a lot of variety. We offer a vegetarian option with each meal and plan the menus around foods that boys 7-16 enjoy. Last year the campers rated it an 8.5 out of 10 overall, which we think is pretty good for camp food. Contact Us for a sample weekly menu. How do I get in touch with the office during the summer and winter? You can find all of our contact information here. Current Parents – don’t forget to explore the Parent HQ for all the ways to stay in touch as well. How do I enroll? When do spots normally fill up? Spots fill up very fast so make sure you sign up and secure your place for next summer. Do you require camp uniforms? Where can I buy CM Gear? We do not have uniforms at camp, but we do encourage our boys to wear CM gear as much as possible to show off their Green & White Pride! What kind of Medical staff do you employ? Do you have Nurses and Doctors? How close is the nearest hospital? We have multiple medical professionals on staff each year that staff our Health Club. We hire full time nurses (RNs and CNAs) who live on the grounds all summer and volunteer Doctors that rotate throughout the summer. The Menominee Health Center is located on grounds, and we are 15 minutes from the nearest hospital in case of an emergency. Are you a medical professional looking to work or volunteer at camp? Contact us today for more information. I have a daughter at a girls camp near by. Will my kids see each other? Yes they will! We have great relationships with the local girls camps and have a number of socials each session. Sending your camper away for the first time is challenging for many reasons, but it can be terrifying if he has a food allergy. How do you truly trust that the camp you have chosen for your son can appropriately handle his allergies while at the same time provide him a balanced and nutritious diet over the summer? I wanted to take a minute to tell you about how we handle food allergies at Camp Menominee. We do not serve or use nut products camp and cater to special diets. We do not cook with anything that we know to have peanuts or tree nuts or processed in a factory with either. The trouble with this is that a lack of a label on products does not always indicate that the product is nut-free. To combat this, we have been working with our suppliers as well as organizations like FARE (Food Allergy Research and Education) to identify the mass distributors that fit our needs and are allergy safe. As camp gets closer parents will work with Jason and our kitchen manager and chefs to ensure that all allergy needs are accommodated. If we need to create a special menu with safe ingredients just for your son, we can accommodate. We set up a seamless process for this at each meal so the boys don’t feel singled out by their allergy. Does your son have food allergies? We want to introduce you to Jacob. He came to camp 3 years ago with a myriad of food allergies and has thrived in our system. How do medications work at camp? All camper medications are pre-packaged at camp and organized by date, time of day, medication and dose. Parents will fill out the Health History form (located on the CampInTouch Dashboard) and notify camp of each medication their camper is taking. Parents will send all medication in its original packaging along with any prescriptions and instructions to camp by June 1st. For more information, please refer to our Parent Handbook which can be downloaded from your CampInTouch Dashboard. Current Parents Log-In to your account. Future Families – contact us with any camper medication questions. Where can I find a list or explanation of Camp Menominee Policies? If you are a current parent, check out our Parent HQ or all of the information you need. Otherwise, if you can’t find what you are looking for on our site or in our FAQs…Contact Us and we will send you our full Parent Handbook which will walk you through all of our policies. Can I come visit my son at Camp? Of course! Every year we have visitors weekend when the parents can come up, spend time at camp, and even take your son out of camp for 2 nights. This year it is July 13-July 15th. I feel like there is so much I need to do as a parent to get ready for camp. Can you help walk me through everything? Preparing for camp can be nerve racking, but we have got you covered! We have created a Parent Hub for all of our current families. This will give you month-by-month tasks and guides to everything you need to know and do to prepare for camp this summer. The information on the parent hub includes: Packing, Communication & Email, Required Forms, Travel & Baggage, Visiting Weekend, Important Dates, Camp Policies, Help Videos and much more. How do you celebrate birthdays at camp? Hail, hail the gangs all here!! We LOVE birthdays!!! It can be tough for a boy to be away from his family on his birthday so we make sure the Menominee family makes it a special day. Each boy will get a special cake made by our chefs and the entire camp will sing our unique birthday song to the birthday boy. We’d be lying if we told you we didn’t jump and scream and dance around the mess hall while we celebrate! This is also the only time you can talk to your son on the phone. We set a time to have a quick happy birthday call with his family. 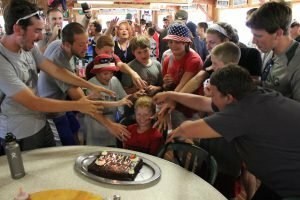 Does your son have a birthday at camp? Let us know and we can set up something special! Where do we celebrate birthdays? In our Mess Hall! Check it out and all of our other Incredible Facilities. How long are your sessions? How do I know which Session is right for my son? Where can I learn more? Camp Menominee offers a wide variety of programs throughout the summer. We have 2-week, 4-week and 8-week sessions, as well as our Father & Son Weekend and a relaxing Family Camp. Our Programs Page will walk you through each session so you can make the right choice for your family. How competitive is your camp? Competition is one of the more polarizing topics in camping. How competitive are you? Are you a competitive camp? A central tenant of our program is choice for the boys. We allow our campers to choose their activities at camp, meaning they can “compete” as much or as little as they would like, but the real question you want to ask is “How does your camp approach competition?” Many applaud the positive role competition at camp can play, while some maintain it is a negative thing. We believe this debate misses the point. Anytime you engage in an event resulting in a winner and loser, there is competition. Sometimes in life, our greatest challenges become our ultimate triumphs. Our focus is not on the outcome, but on how we can grow and what we can learn. At camp we keep score, we keep standings and we definitely like to win, but our main focus is what we can learn from our successes and how we can grow from our losses. We are not the camp that will put you on the bench just because you are not the most skilled. If a camper is brave enough to try something new, and step outside of his comfort zone, our staff will teach him the skills and the rules and nurture his development at any sport or activity. Sometimes you win, sometimes you lose, but you can always learn. Who will be coaching and instructing the activities? Each activity is taught by a certified or experienced instructor, who has playing or coaching experience at an advanced level. For example, all of our waterfront staff are certified Red Cross Lifeguards and our Climbing Wall staff are certified each season to instruct climbing and zip-lining. We also bring in local professionals like our USPTA tennis instructor to give private lessons and clinics for the boys. What type of evening programming do you do? Dinner does not mark the beginning of the end of each day…at Menominee when it get’s dark, we are just getting started! Our boys will run around doing all-camp activities after dinner. Then we will have mandatory daily showers followed by canteen, followed by our evening program. This is where some of our boys really shine. We do skit nights, talent shows, song & cheer nights and a myriad of other events that lets our goofy side come out on full display. What type of Special Events do the boys take part in during the summer? We have the most diverse and unique program in the Northwoods. We offer Intra-Camp events like our Green & White Color War, Inter-Camp competitions against other camps, Lazy Day Sundays and so much more. 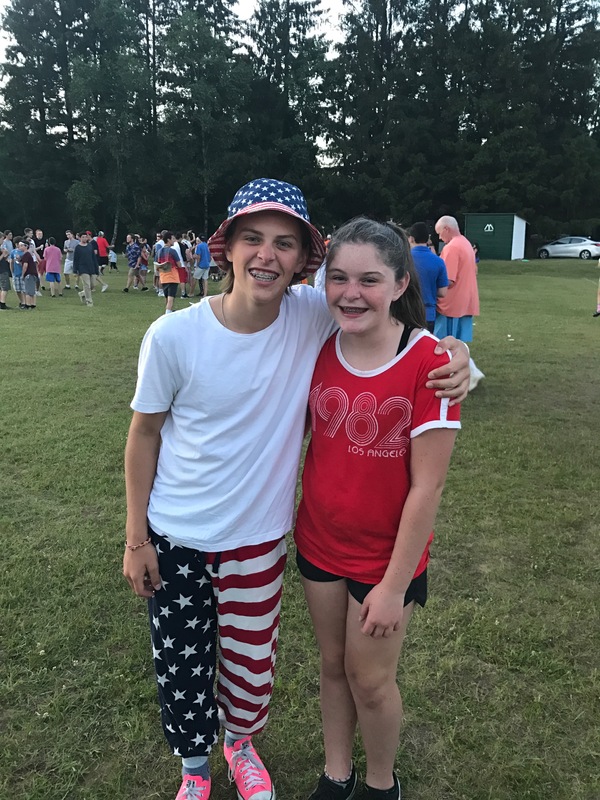 The flow of any given week at camp includes these unique days and activities like Camper-Counselor Switch (yep, campers and counselors switch roles), 4th of July Fireworks, Toga Party, Doc’s Run (CM’s annual road race), Swim the Lake Club (the guys swim the length of Sand Lake! ), Town Day including the Minocqua Ski Show, Picture Days, Trip Days, Camp Fires, Skit Nights, Menominee Rock Band Concert, Plays and Skits, Horse Race Night, CM Casino, Bingo, the Decade Club, Five Year Night, the Awards Banquet…Sounds fun, right? They are! Do you offer private lessons in any sports or activities? It is often a challenge for kids to balance camp with sports or activities they concentrate on at home. How will they get in the practice they need to stay competitive while they are away for 4 or 8 weeks? At Menominee, we make sure to hire experienced coaches and teachers so your son can keep up with his regimen while also enjoying camp. For example, each session we have an experienced golf professional come up to camp to run clinics for our boys and offer private lessons. We have USPTA Tennis professional on staff that you can book a set of lessons with. We can also set up time at any sport or activity that your son wishes to put extra work in. Email the office (or fill out this form) and let us know if your son would like private lessons or extra work in certain activities). Contact Us to set up a single or package of lessons over the summer. Do you offer overnight trips? What does this program consist of? Our goal is for every camper to go on an overnight trip while they are at camp. The trips get progressively more involved as the boys get older. We do everything from hikes to local waterfalls and camp-outs, to canoe trips where the boys will build their own tents and cook their own meals, to an amazing white water rafting trip that our Senior Cabin is lucky enough to experience! We also have hot dog cookouts on Sunday evenings. Each cabin will build and maintain a campsite on grounds and head into the woods to cook their own dinner every Sunday night. Do you do any off-camp day trips? While most of our programming is in camp, we do provides some special off-camp day trips during the summer. Each session we take the whole camp into Minocqua for town day, we often head over to girls camps for socials and some other very cool events that we can’t tell you about until you get to camp! Do you offer any other programs we should know about? We offer tutoring…and it’s free! We tutor boys in most school subject and we also offer Bar Mitzvah Tutoring. Contact Us to set up tutoring or learn more.